reversing gender gap | Utopia – you are standing in it! This entry was posted in development economics, gender, health economics and tagged reversing gender gap on January 29, 2019 by Jim Rose. This entry was posted in discrimination, economics of crime, economics of education, gender, health economics, human capital, labour economics, labour supply, law and economics, occupational choice, poverty and inequality and tagged law and order, life expectancies, reversing gender gap on January 5, 2019 by Jim Rose. This entry was posted in economics of crime, law and economics, poverty and inequality and tagged reversing gender gap on December 30, 2018 by Jim Rose. On the upside, Goldin (2006) showed that women adapted rapidly over the 20th century to changing returns to working and education as compared to options outside the market. Their labour force participation and occupational choices changed rapidly into long duration professional educations and more specialised training in the 1960s and 1970s as many more women worked and pursued careers. The large increase in tertiary education by New Zealand after 1990 and their move into many traditionally male occupations is another example. The key is what drives the rapid changes in the labour force participation and occupational choices of women. Some of the factors are global technology trends such rising wages and the emergence of household technologies and safe contraception and antidiscrimination laws. All of these increased the returns to working and investing in specialised education and training. Up until the mid-20th century, women invested in becoming a teacher, nurse, librarian or secretary because these skills were general and did not deprecate as much during breaks. When expectations among women of still working at the age of 35 doubled, there were massive increases in female labour force participation and female investments in higher education and specialised skills (Goldin and Katz 2006). These trends continue to today. Women and in particular those women making education choices need good information on their prospects in different occupations. The evidence is they adapt rapidly to changing prospects (Goldin 2004, 2006). Goldin (2004, 2006) referred to a quiet revolution in women’s employment, earnings and education because the changes in female labour supply and occupational choices were abrupt and large. Women adapted rapidly to changes in their expectations about their future working life, graduation rates, attainment of professional degrees, age of first marriage, and the timing and number of children. These expectations of women about their futures turned out the surprisingly accurate (Katz 2004, 2006). Young women are surprisingly good forecasters of their labour market involvement. Any gender policy options must be sensitive to the high level of responsiveness of women to changing educational opportunities and prospects and their precision to date as forecasters. The complex decisions youth make about education and occupational choices is driven by many sources. Women are interested in issues that are of less importance to men such as work-life balance and the costs of career breaks to their earning power and human capital. Goldin (2004, 2006) argued that women who have a more accurate assessment of their future labour market involvement will invest more wisely in education and occupational choice. The market process rewards the skills and commitment the men and women bring to the labour market. The differences in skills and commitment the men and women bring arise from a gendered division of labour and effort in the household and in raising families that appears to be open to only minor changes that are expensive in terms of growth and prosperity. 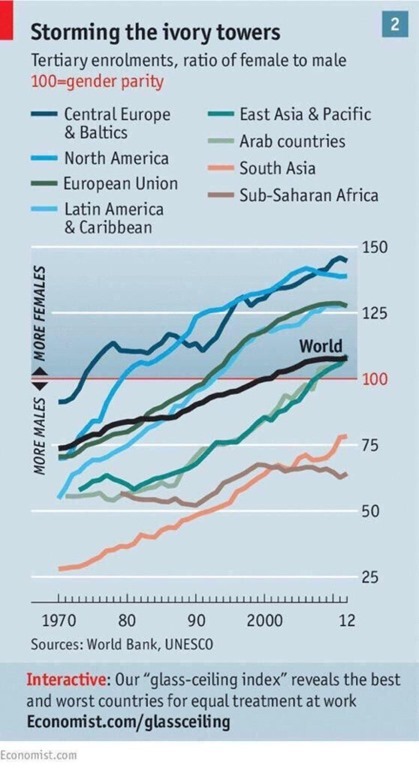 This is because most gains in the status of women were the result of economic growth rather than legal interventions. Child care subsidies and parental leave arose after rising income made them and the modern welfare state fiscally affordable rather than the other way around. This entry was posted in discrimination, economics of education, gender, human capital, labour economics, labour supply, occupational choice and tagged College premium, gender way, reversing gender gap on May 1, 2017 by Jim Rose. Rosen (2004) suggests that the engineering market responds strongly to economic forces. The demand for engineers responds to the price of engineering services and demand shocks such as recessions and defence cuts. 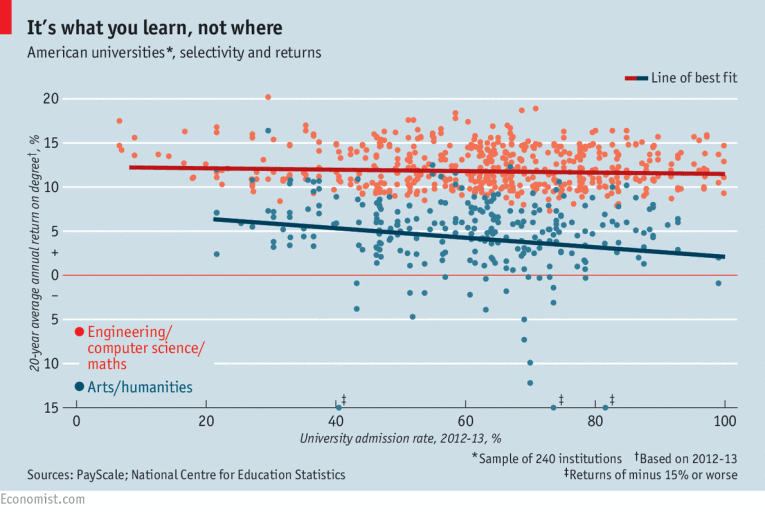 Supply and enrolment decisions are remarkably sensitive to career prospects in engineering. Students also appear to use some forward-looking elements to forecast demand for engineers. Many students also change their majors in light on more information on whether the like their current choices and other news (Bettinger 2010). This evidence of students use forward-looking elements to forecasting the occupational demand for human capital suggests that better information may improve these choices. The government has made a distributional judgment to expand the choices open to women. The growing evidence of relatively accurate forward looking decisions making by students suggests that they will respond to additional information on prospects in different careers. In addition, earnings from some occupations are also more uncertain than others. The STEM occupations are an example where shortages and, in particular, surpluses are more common because durable goods industries bear the bulk of business cycle risk. There is also the political unpredictability of defence and R&D spending. Women seem to prefer jobs that are more secure. Some occupations have higher risks of injury than others. Fewer parents, and both single fathers and single mothers, in particular, enter these more injury prone occupations. These gender-based preferences about hazards and uncertainties will lead to fewer women entering occupations that are more injury prone or more at risk to recessions and industry-specific downturns. Occupational segregation will still persist in the labour market in the relative absence of either discrimination or a gendered division of labour and household effort. This entry was posted in discrimination, economics of education, gender, human capital, labour economics, labour supply, occupational choice and tagged college major, College premium, gender wage gap, graduate premium, reversing gender gap on April 28, 2017 by Jim Rose. There are important drivers of occupational segregation that are not related to either discrimination or a gendered division of labour. These newer drivers are strong enough to explain most of the gender differences in tertiary education attainment. These gender differences in tertiary attainment and the drivers behind them will be important determinates of the future occupational segregation and entry into male dominated professions. An important driver of occupational segregation is modern technological trends ranging from ICT to the emergence of a larger service sectors that have worked to the comparative advantage of women. Many more service jobs and fewer jobs based on brawn have increased the returns to women of working more in the market. In addition, a range of personality traits and skills work to the advantage of women in some occupations more than others. Another driver of occupational segregation is women have more occupation choices than men because of different personality traits and superior verbal and readings skills. The superior verbal and reading skills of teenage girls are the equivalent of ½ a year’s extra schooling (OECD 2012). Teenage girls also score higher on personality traits such as persistence. Teenage boys have many more behavioural problems. Boys do especially poorly in broken families (Bertrand and Pan 2013). Jacob (2002) found that higher non-cognitive skills and larger college premiums for women accounted for 90 percent of the gender gap in higher education. 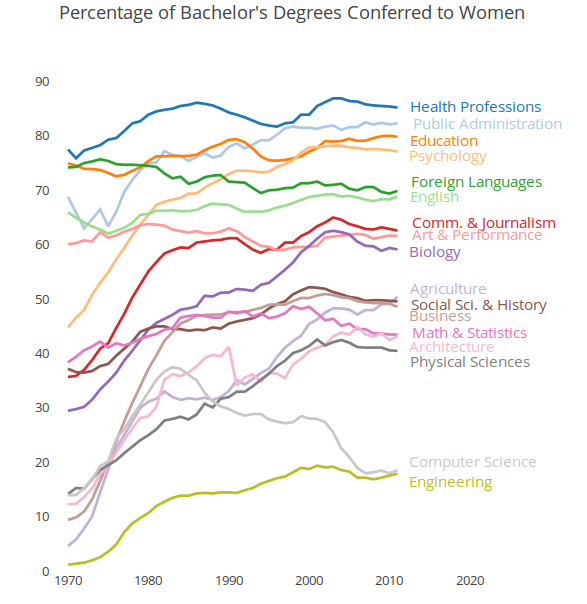 Becker, Hubbard and Murphy (2010) found that differences in the costs of college for women and men are primarily due to differences in the distributions of non-cognitive skills and explain most of the world-wide overtaking of men by women in higher education. About 64% of recent New Zealand graduates were women but they have personality traits and verbal and reading skills that will be rewarded more in interactive professions and occupations. Women are pursuing these comparative advantages and maximising the rewards on their skills and natural talents. These differences in skills and talents will lead to different occupational and sub-occupational distributions and mixes as compared to men despite any differences arising from the gendered division of labour and effort and costs of care giving. There are fewer women in STEM occupations because they have better options elsewhere to reward both their mathematical and scientific talents and their superior verbal and reading skills. The wage premium for STEM occupations for women is much smaller because they have options elsewhere that reward all of their skills, not just their STEM related talents. Young women and well as young men do equally will in the STEM prerequisites. Women have more options is other higher power occupations that make full use of their more diverse talents. Occupational segregation in the future in part will be driven the same factors behind much higher female tertiary educational attainment. Superior verbal and readings skills and greater persistence and self-organisation among women will make some occupations more rewarding for them as compared to males who have, on average, fewer of these innate talents. This entry was posted in discrimination, economic history, economics of education, gender, human capital, labour economics, labour supply, occupational choice and tagged College premium, gender, reversing gender gap on April 26, 2017 by Jim Rose. This entry was posted in health economics and tagged Darwin awards, reversing gender gap on April 11, 2017 by Jim Rose. Why no unconscious bias against 20 something women to keep their pay down? 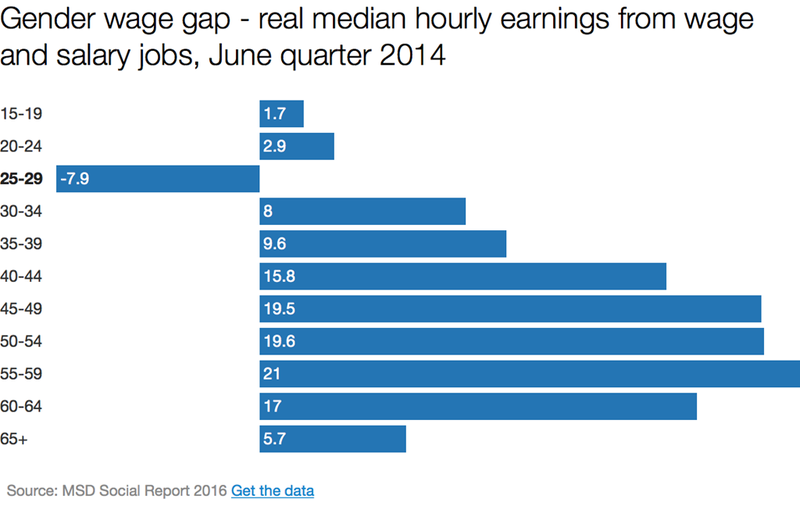 This entry was posted in discrimination, gender, labour economics, politics - New Zealand and tagged gender wage gap, reversing gender gap, unconscious bias on March 27, 2017 by Jim Rose.